Hello again, quilters! I hope you are excited for Quilts of the Plains. The 13th annual outdoor quilt show is just one week away. This year’s quilt show will be held on Saturday, June 23. There is just enough time for you to finish those last minute bindings, and put your newest quilted creation into the show. Or, maybe you’ve got a project from months, or years ago that could use a bit of fresh air. We encourage you to exhibit your work for everyone to enjoy. And who knows… you might be the viewer’s choice quilt, earning you a wonderful new Janome JEM Gold sewing machine, courtesy of all of our sponsors. Again, I remind everyone that there will be an open sewing night at RR Branded, 305 Main Street in Wray, on Friday evening, sponsored by the local quilt guild, Quilter’s Anonymous. You are welcome to bring any project that you are working on, and spend an evening with friends. We will have some items on display; just to give you an idea what this group is all about. A fun time is guaranteed. 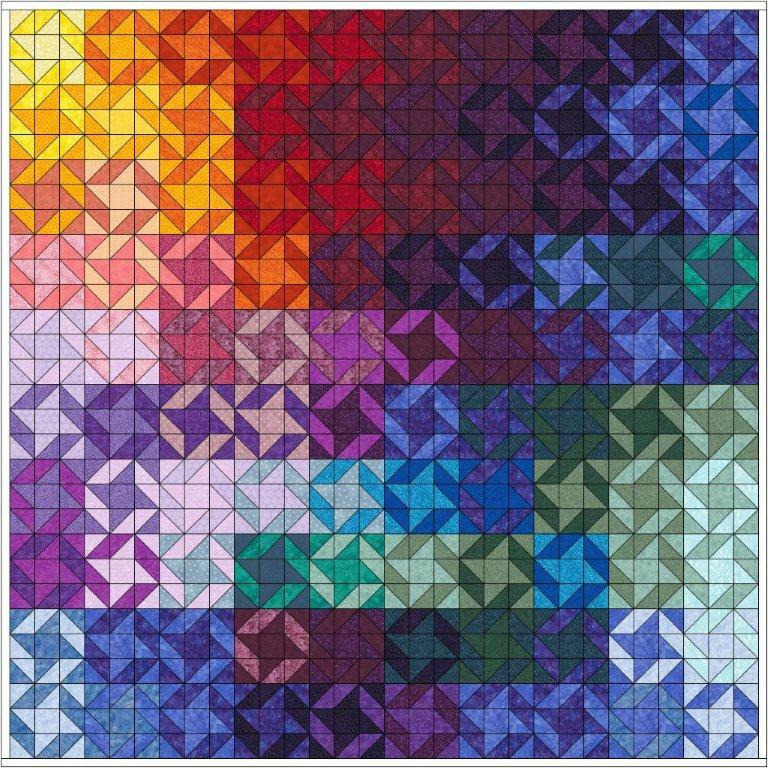 This is a rendering of the Quilts of the Plains Raffle Quilt 2012. The quilt is pieced using batiks, made by many local quilters… I hear Christine Wade made 35 blocks. Wow! Thanks to all who helped!!! We are currently selling raffle tickets on a beautiful patchwork quilt. This quilt would look great in your home, but that won’t be possible, unless you buy a ticket. The quilt is on display in the window at Rainbow Fabrics, and you can buy tickets there, or from any of our committee members: Shana Gardner, Nicole Harford, Wanda Harford, and myself, Brian Clements. If you would like to volunteer some time to help with QOTP, we are hosting a party at the home of Joe Foltmer and Brian Clements on Tuesday, June 19th at 6:30pm. The address is 403 Franklin in Wray. Dinner will be provided for all of the volunteers, and final assignments will be given at that time. If you can help, please contact Wanda Harford or Shana Gardner. We appreciate all of the volunteers. Quilts of the Plains helps the Wray Chamber of Commerce, in their mission to provide activities, such as Wray Daze and the Harvest Festival each year.